You are an arrow, you move like a ball. You are... BALLARROW!!! Ahem.. well, yes, you are rotating, press "SPACE" and the arrow will move in the direction you are facing. Press "R" and will rotate faster. Collect coins, avoid mines, aim for highscore. Game completely made this weekend, only sounds used from stock. This is a one-button game of avoiding danger in a distant moon base. While its control scheme is familiar - press button to make the spinning craft move forward - the wrinkle is that it keeps spinning even while moving, so you'll be constantly moving in wide arcs. Be careful, and watch out for those cannons! 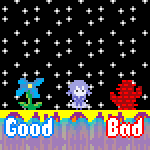 This is loosely inspired by the Taito arcade game Volfied in scenario.